A Series of Twenty-one Heliotype Plates Illustrating the Progressive Stages of the Eruption. Boston : S. A. Powers, 1882. Description :  p., [21 l.] pl. ; ill: 21 phot. ; 23.5 cm. Photographs : 21 stub bound heliotypes. Subject : Skin — Variola. Author caption: SAMUEL A. POWERS, Superintendent Small-pox Hospital, Boston. Cited: (1882), Tenth annual report of the Board of Health of the city of Boston, for the financial year 1881-82. Boston: Rockwell and Churchill ; page 36. Photographs are captioned in the negative. Inscribed: Wm. H. Ensworth. Received from Dr. Cutter Chelsea Mass., March 29, 1888. The head nurse, Mr. Powers, who has been in this service for the last sixteen years, has been discovered to be a good photographer; and, with the consent of the patients, several excellent photographs have been obtained at different stages of the disease. The opportunities for seeing photographs of this kind are so rare that we have thought it well to publish herewith one taken on the eleventh day of the eruption, which shows in a marked degree the typical umbilicated pustules, on the legs, in a severe case of discrete small-pox. The entire surface of the skin presented the same appearance except on the face, where the eruption was confluent. This patient was discharged perfectly well at the end of twentyfour days, with comparatively little pitting. In fact the man was well some considerable time before he left; but as a few crusts remained on the skin, and as he was sure to convey contagion thereby, he was kept at the hospital until all chance of danger had been removed. In very many of the cases, particularly the mild ones, the patients are isolated for some time after they have recovered, for this reason.—Excerpt from the annual report of the Boston Board of Health, 1881-1882. Samuel Powers and his wife, Mary F., worked together as superintendents of Boston's small-pox hospitals. Mary died in November following the publication of this book, the first photographic journal of small-pox, and the Board of Health elected the Powers' daughter, Cora E., to her mother's position. The following plates represent the appearance of variola at different stages of the eruption. The first sixteen pictures show its appearance on the same patient, from the third to the fourteenth day, when it began to disappear. The patient entered the hospital on the ninth day of October, 1881, and remained until the second day of November following, when he was discharged well. The remaining plates are of patients in the same hospital, and all were under the professional care of the City Physician of Boston. Clicking on the thumbnail image below will bring up a slide show of the convalescent seated on the edge of his sick bed. 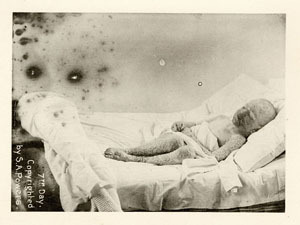 There is a selection of 11 images, one for each day of the illness beginning with day three when he entered the hospital and was diagnosed with smallpox. Because there are so many images, the slide show takes a little while to preload. Please be patient.